Sophomore Chris Paton (Glasgow, Scotland/Uddingston Grammar School) scored in the 74th minute and redshirt junior goalkeeper Andrew Glaeser (Walla Walla, Wash./Walla Walla/Oregon State) made four saves as the NIU men’s soccer team defeated 23rd-ranked UIC, 1-0, on a crisp, rainy Friday night at the NIU Soccer Complex. The victory is the first over a ranked opponent for NIU head coach Eric Luzzi and the first for the Huskies since knocking off No. 2 SMU, 1-0, on Sept. 19, 2008. Scoreless at the intermission, both teams had a chance early in the second half as a header by Zack Judickas was saved by Glaeser in the opening minute of the second 45 minutes. A minute later, NIU won a free kick that was played across the box to junior Charlie Oliver (Crystal Lake, Ill./Crystal Lake South) who set up senior Dusty Page (Germantown, Wis./Kettle Moraine Lutheran) for a shot that was blocked, the rebound fell to freshman Len Heinson (Wuppertal, Germany/Carl-Fuhlrott Gymnasium) and his shot went high. In the 58th minute, the Flames nearly took the lead as Joel Salmeron’s shot slipped under Glaeser on the wet turf and rolled slowly toward goal before being cleared off the line by a Huskie defender. Heinson had another opportunity in the 69th minute as he struck a half-volley off a corner kick that forced a save from UIC goalkeeper Andrew Putna. 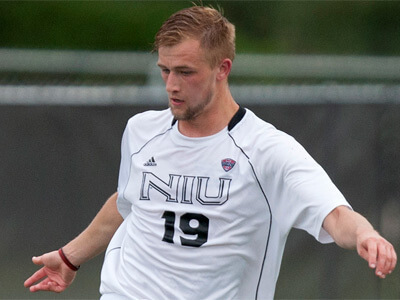 NIU (2-2-1) found the breakthrough in the 74th minute as Paton was on the end of good combination play by the Huskies. Senior Isaac Kannah (Plymouth, Minn./Prairie Seeds Academy) connected with sophomore Richard Hall (Billericay, England/The Billericay School). Hall found Paton inside the box and the Glasgow, Scotland native tucked a shot inside the post from about eight yards. 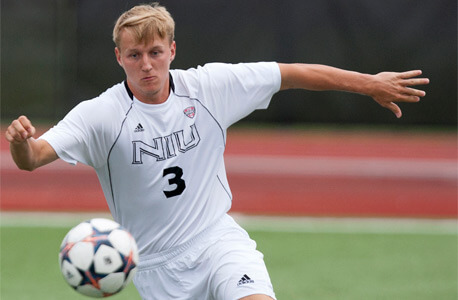 Paton had a chance to double the NIU advantage in the 81st minute as he unleashed a rocket from 25 yards that forced Putna into an excellent save at full stretch. 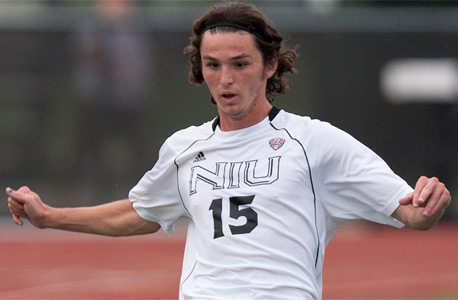 In the opening half, NIU had an opportunity in the 18th minute after earning a free kick 23 yards from the UIC goal. Paton took the free kick and sent his shot high. The Flames created an opportunity in the 23rd minute with combination play that set-up an excellent opportunity for Sergio Fuentes, but he put the shot wide. A giveaway by the UIC defense gave Oliver a chance to open the scoring in the 31st minute. The Flame defender slipped near the edge of the box giving Oliver the opportunity to gain possession and have a look at goal, but his shot was straight into the arms of Putna. UIC (3-1-1) earned four corners in the final 10 minutes of the opening half but could not capitalize on any of them as the game went to the intermission scoreless. Putna made seven saves in goal for the Flames. NIU will return to action at 6 p.m. Sunday, Sept. 14, as the Huskies host Green Bay at the NIU Soccer and Track & Field Complex.